Pair of fully restored and refinished swivel chairs by Milo Baughman. Chrome wrapped frames and bases. New mohair upholstery. Large scale swivel chair by Milo Baughman. Fully restored. Reupholstered in blue mohair. Refinished walnut swivel base. Rare rosewood case swivel chair with ottoman by Milo Baughman. Fully restored and reupholstered in lux silk/angora blend mohair. 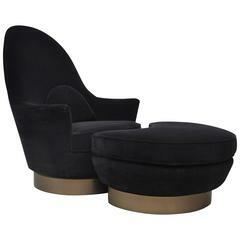 Milo Baughman for Directional brass base swivel chairs. Fully restored and reupholstered. This swivel armchair by Milo Baughman retains it's original beige and grey patterned fabric. It's very comfortable like all the Milo Baughman designed chairs. Offered by OLIVER MODERN Large scale Milo Baughman swivel lounge chair for Thayer Coggin. Walnut base.